Hirunya Suchinai inaugurating the daylong ‘Bangladesh Development Fair 2018’ in Bangkok on Wednesday. Dhaka, Oct 17 : Thailand’s Minister for the Prime Minister’s Office Hirunya Suchinai has commended Bangladesh for a decade of sustained growth and prosperity with a spectacular 7.86 percent economic growth this year, one of the highest in the region and looks towards a deeper economic engagement. She made the remarks while inaugurating the daylong ‘Bangladesh Development Fair 2018’ in Bangkok on Wednesday. The Bangladesh Development Fair 2018 was organized by the Embassy of Bangladesh in Bangkok to showcase Bangladesh’s globally acclaimed sustainable development successes in Thailand. Organised at the UNESCAP premises, the Bangladesh Development Fair 2018 attracted a large crowd including senior Thai government officials, diplomats, academicians, local Thai people, UN officials and expatriate Bangladeshis living in Thailand. ESCAP Deputy Executive Secretary and Officer-in -Charge Hangjoo Hamn also attended as special guest and praised Bangladesh’s for its recent eligibility for graduation from the LDC Group while Gemma Van Halderen, Director for Statistics at the UNESCAP lauded Bangladesh for leveraging statistics and accurate national development data to showcase and record its Sustainable Development successes. Bangladesh Ambassador to Thailand Saida Muna Tasneem said they have designed the Bangladesh Development Fair 2018 in Thailand specially to bring the common Thai people, UN Offices in Bangkok and expatriate Bangladeshi community closer to the robust economic growth and social development achievements of our people under the dynamic leadership of Prime Minister Sheikh Hasina. The daylong Fair organized by the Embassy of Bangladesh in Bangkok showcased 15 exhibition booths on Liberation War history and the Father of the Nation Bangabandhu, Bangladesh’s as Asia’s growth leader, Bangladesh the Role Model for social inclusion, Digital Bangladesh and Industry 4.0, Bangladesh Migrant Workers, pride of the nation, Bangladesh Championing sustainable Agriculture, Fisheries and Tourism, Bangladesh leading the women empowerment agenda and Bangladesh on path to graduation from LDC and Bangladesh-Thailand friends and neighbours at the Bay of Bengal. 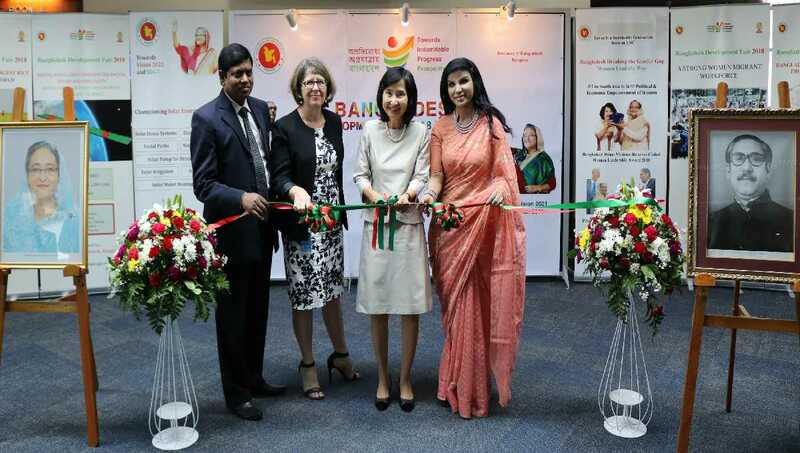 The Embassy decorated the UN Office premises in Bangkok colorfully with many exhibition booths, festoons and banners holding Bangladesh flag, national colours, and portraits of Bangabandhu and served an array of delicious Bangladeshi food appreciated by all.